Many Shias turn an agate/aqeeq (or other stone) ring around during Qunoot (hands raised in suplication after end of second surah in second cycle/rak’ah) and turn it back around after they finish Qunoot. Is there any basis for doing this? There is no doubt in the recommendation of wearing an aqeeq ring during Salah, but as far as our research is concerned regarding turning the ring, we could not find ANY hadith to support this. Furthermore, when we look at the fatwas of our scholars, we find that they also find no support for doing such actions. 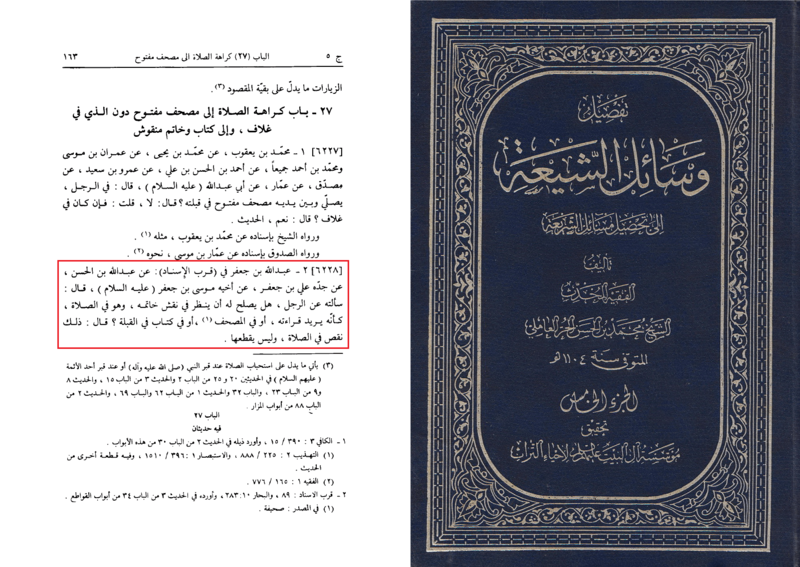 In fact, we also find hadiths/fatwas that could deem it makruh (disliked) depending on the type of ring that you have. الجواب : لم نجد الاستحباب فيها على اطلاقها. Question: Is turning the noble stone on the ring towards the sky during the qunoot, or indeed any supplication, recommended? Answer: There is no recommendation in it in general. وجود خاتم العقيق في اليد – كما في الحديث الشريف – من أسباب استجابة الدعاء في القنوت، وليس تحويله. Purified Household Note: i.e. as the many hadiths mention, the wearing of the ring itself is what is recommended, but this has nothing to do with the turning of the ring towards the sky/face. الجواب : لا توجد رواية ظاهراً . Question (64): Some of those who prayer during qunoot turn their ring on their fingers, is there any hadiths on this from the Imams (As) ? Answer: Apparently there is no existence of a hadith to support this. Question: Is it either mustaḥabb or obligatory to rotate one’s ring so that it faces one during the prayer’s qunūt? Answer: It’s neither mustaḥabb nor obligatory; moreover, the canonical soundness of such an act is not proven. Question: Some of the believers during Qunoot in Prayers turn their ring upwards, so does this action have a basis in Islamic Law? Answer: There is no basis. الجواب: لم يثبت استحبابه ولا بأس به رجاءً. Question: Some of those who pray turn their ring during qunoot so that the stone of the ring is on the side of the palm, so is this allowed and is it from the noble sunnah? Answer: Its recommendation has no basis, however, there is no issues in doing it with the intention of hoping for reward (rajaa’). So, overall, there seems like there is no basis for this innovation in our salah, however our scholars have not deemed it forbidden, and in fact Sayed al-Sistani says there is no issues in doing it. However, what if your ring has writing on it? (In prayers) It is also Makrooh to look at the writing of the holy Qur’an, or some other books or a ring. Purified Household Note: if your stone has any sort of writing upon it, such as an Ayah of the Qur’an or the name of the Infallibles (as), then it is makruh (disliked) to look at it. `Abdullah b. Ja`far in Qurb al-Isnad from `Abdullah b. al-Hasan from his grandfather `Ali b. Ja`far from his brother Musa b. Ja`far (as). He said: I asked him about the man, is it appropriate for him to look at an engraving on his ring while he is in salat, as he wants to recite it, or in a book, or in writing towards the qibla? He said: That is a deficiency in the salat but it does not break it. Thus, it seems there is more issues with turning the ring around than there is reward and recommendation. It is a big wonder to see how many Shia have adopted this custom and for what reason they do this.